University of Ulster Nursing students have taken part in a special interdenominational service to commemorate the life and work of Florence Nightingale. Organised by the University of Ulster in partnership with the Western Health and Social Care Trust, the service was hosted in St Columb’s Cathedral, Derry~Londonderry. The annual event, which coincided with International Student Nurses’ Day, also celebrates the role and contribution of all staff - nursing and midwifery and unqualified staff working in the Health and Social Care Service. 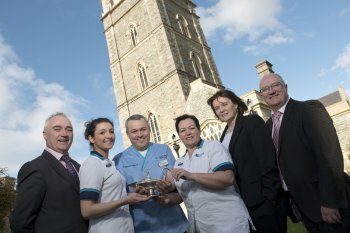 Nursing students from the university’s Magee campus took part in a procession led by Brian McFetridge, Consultant Nurse, Western Trust, who presented the Nightingale lamp to the Dean of St Columb’s Cathedral to place on the altar. The procession was organised to represent the passing on of knowledge from one nurse to another and to highlight the diversity of care given by nurses for the benefit of humanity. Professor Hugh McKenna, Pro-Vice-Chancellor (Research and Innovation), said: “Florence Nightingale is the mother of modern nursing. She knew that the very best nurses used their hands, heart and head.